Savannah cat babies are kittens, not cubs. It is a sales method. 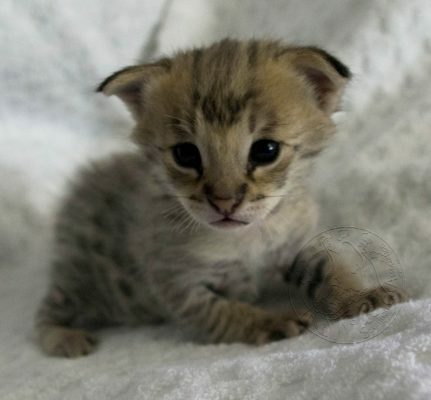 Many breeders call Savannah kittens cubs instead. The Savannah Cat Association wants to make it very clear that Savannah babies are kittens, not cubs. This is mainly a sales approach. To begin, the United States Department of Agriculture defines hybrids of domestic cat with a wild/exotic cat (Bengal, Savannah, Chausie…) and wolf with a dog (wolf dog) as domestics. Therefore the answer is a Savannah litter is a litter of kittens, not cubs. Not everyone understands the difference between a kitten and a cub. Two Genus of cats exist; Felidae (true cats and most small wild cats) and Panthera (tiger, lion, jaguar and leopard). The Cheetah is Felidae, and subfamily Felinae, Acinonyx jubatus. Actually, panther technically refers to every cat in the genus Panthera. Yet, it usually refers to the black panther. A melanistic jaguar or melanistic leopard and also the Florida panther, a subspecies of the cougar. Interestingly, the cougar is genus Felidae. So you see how this can get quite confusing. Still, a mystery is how some confuse a leopard spotted cat as a tiger. The term ‘Big Cat’ is quite often used to refer to the Panthera genus. The serval is Felis Serval. Also sometimes referred to as Leptailurous serval and falls into the ‘most small wild cat’ definition. Despite enormous differences in size, the various species of cat are quite similar in both structure and behavior, with the exception of the cheetah, which is significantly different from any of the big or small cats. Scientifically the difference between whether a cat offspring is a kitten or a cub is determined by whether or not the parent roars or purrs. Roaring. The ability to roar comes from an elongated and specially adapted larynx and hyoid apparatus. When air passes through the larynx on the way from the lungs, the cartilage walls of the larynx vibrate This produces sound. The lion’s larynx is longest, giving it the most robust roar. All Panthera cats have elastic sections on both sides of the hyoid bone, a structure which supports the tongue and its muscles. The elastic hyoid, combined with the fibro-elastic tissue on top of the big cats’ undivided vocal folds, acts like a slide trombone, enabling the big cats to roar. BIG CATS CAN ONLY PURR WHEN BREATHING OUT. The smaller cat species have kittens, not cubs because they purr. The hyoid of smaller cats is solid bone. These cats can purr when breathing both in and out, but they can’t roar. Cougars purr. Cheetahs purr. The ‘big cats’ chuff but cannot purr. As a future reference, the Genus Panthera; i.e. tigers, lions, jaguars, and leopards roar, chuff and give birth to CUBS. The Genus Felidae, house cats of all breeds, all small wild cats such as serval, Asian leopard cat, sand cat, cougar, caracal and the like, purr and their babies are called KITTENS.